Design a safer round pen for the horses you love most! Flex Fence® can be used for many different styles of horse containment systems. The European-inspired Tuscany horse stall is classy and durable. You choose your finish/options and design the stalls of your dreams! Coated wire is great for making a combination fence system and can be run with multiple different fence types. Each rail has up to 1,400 lbs. of break strength! Equine Solutions for over 30 years! 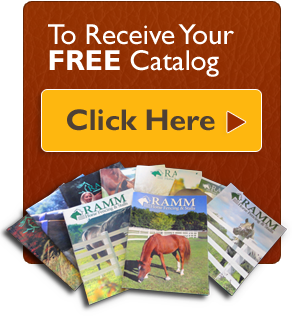 RAMM offers comprehensive selections of horse stalls, horse fencing systems, and equine products for your farm and barn. Rest assured, we only use the finest quality materials and detailed craftsmanship to ensure our horse stalls are stronger, safer, and more durable. RAMM horse fences are made specifically for the equine industry and provide a strong barrier, with the added safety of flexing upon contact. Our horse fencing systems require very minimal maintenance, have strong break strength, as well as an extremely long lifespan with great visibility. Speak with one of our expert account managers at 800-434-6296 for custom layout options or a shipping quote!